Oversee all important information for each department at a glance. Restrict visibility of sensitive information to just HR managers, or make other information public for all employees to see such as employee directory. 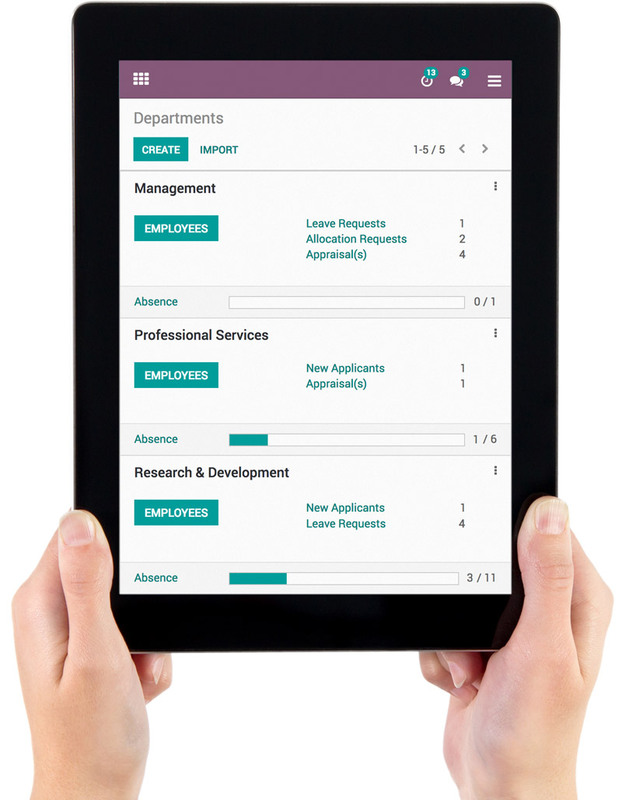 Receive alerts for any new leave requests, allocation requests, applications, appraisals, and more. Weekly or monthly timesheets with optional attendance tracking. Keep track of the employee hours worked and sort by project, client, or tasks. Easily access statistics to record and analyze timesheets as well as check each employee's attendance. Integrated accounting automatically posts reports based on time spent in projects providing real-time data. Employees enter their requests (paid time off, sick leave, etc). Managers decide to either approve or refuse time off requests. Notification is sent to the employee and their calendar is updated automatically. Employees can easily submit and justify expenses. Managers can review all expenses and either approve or reject individual requests as needed. Once approved, expenses are immediately updated in Odoo Accounting. Thorough evaluations without the hassle. Easily set up your evaluation process and calendar. Design form-based questionnaires to collect feedback from everyone in the company, from employees to managers, as well as self-evaluations. Automate the entire process so that you can focus on people, not administration duties. Set up a job board to post open positions in just a few clicks and easily keep track of submitted applications. Oversee and manage your applicant pipeline and integrate Odoo Survey to create a screening questionnaire which automatically associates with the candidate record. Improve communication between employees and motivate them through rewards. Let employees collaborate across departments, locations, and Odoo modules by interacting in real-time with live chat, share knowledge and best practices, follow specific people or documents to stay informed, as well as joining interest groups to share expertise and encourage teamwork. Inspire employees to achieve with challenges, goals, and rewards. Design your own targets, define clear objectives, and provide real-time feedback and tangible results. Showcase the top performers for each team and publicly recognize employee and team accomplishments.